Scratch scratch…shake shake…. If your cat is doing this constantly, or if you smell something less than pleasant coming from his or her ears, the culprit may be ear mites—the most common type of mites that cats get. Ear mites look like miniscule crabs. Their preferred environment is your cat’s ear canal, although once in a great while they venture out of the ear, moving to the head and body. What’s particularly unpleasant about these little crab-like mites is what they eat: namely, your cat! They love to feed on the tissue debris and fluids inside the ear canal—ICK! 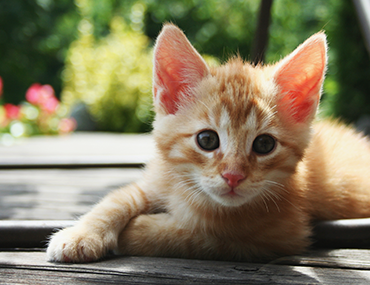 Ear mites are most commonly found in kittens and cats that have poor immune systems (and they can also be found in dogs). They have a three-week life cycle and reproduce rapidly. So, what will you see if your feline friend is plagued with these nasty microscopic mites? Your veterinarian will perform a thorough physical on your cat or kitten, paying close attention to the ears. The veterinarian will want to know if your spends time outdoors, with the possibility of being exposed to other animals, especially other cats. Additionally, it is important to relate if your cat has recently spent time in a boarding facility or other environment where there is regular contact with other animals. Your veterinarian may clean your cat’s ears while he or she is there for her exam. Most likely, a prescription will be written for parasiticides that will kill the mites, as well as an ear cleaner to keep the ear canal clean of debris. Keeping your pet’s ears clean is the best defense against ear mites. Check them often, and if you have any questions, contact your veterinarian, the best resource for information about the health and well-being of your best friend.